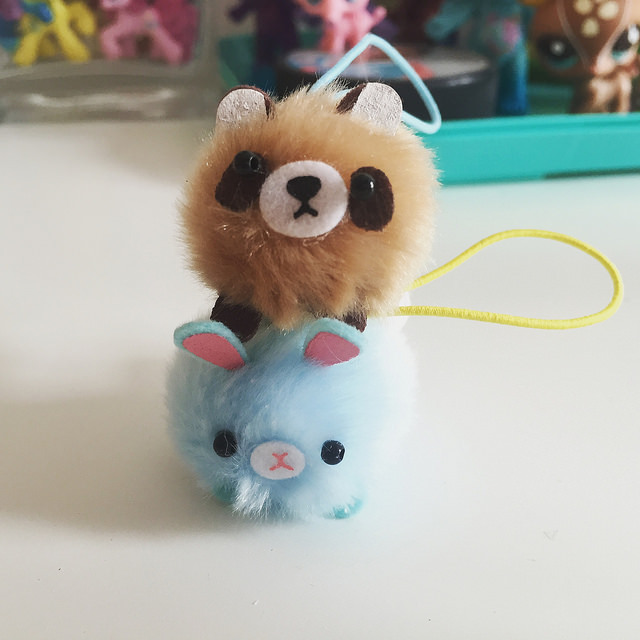 Bloo 'n' Stuff: Tofu Cute Haul! 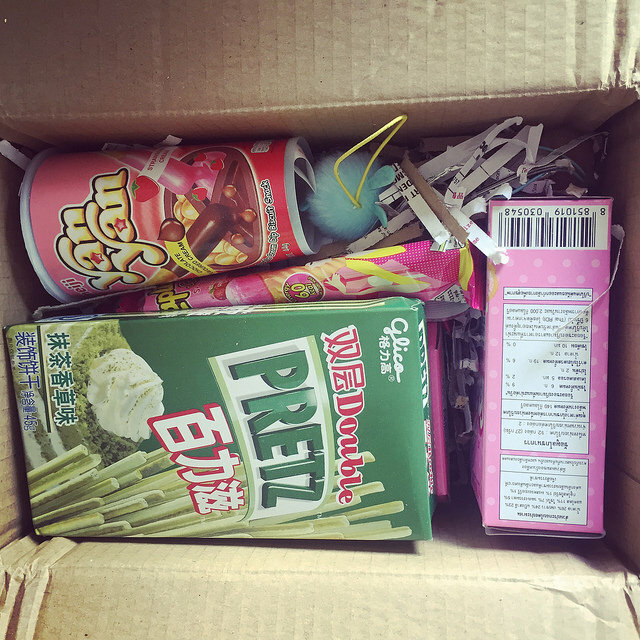 In the last edition of My Week In Words I wrote about my sister ordering from a website called Tofu Cute and how she'd treated me to a couple of things and shared the yummy treats she'd bought with me. I also wrote how I hadn't been able to resist putting in my own order! 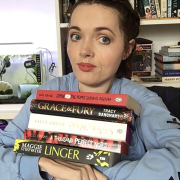 Well, that order arrived and I thought I would make my lovely readers a little jealous by showing you what I purchased and telling you what I think! 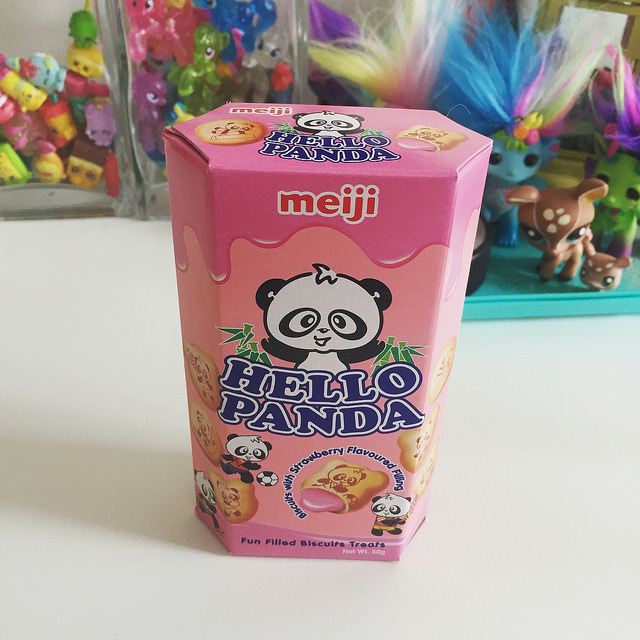 Tofu Cute is a UK based website that specialises in kawaii culture and snacks from Japan and East Asia. They also have a shop in Portsmouth and they have a list of events they're attending on their website. As I've said, Eva introduced me to Tofu Cute. I've known about kawaii culture for a long time but it was Eva's new found love of it that made me jump on the bandwagon. I've always loved all things cute so I don't know why it took me this long! On with the haul. I learned about these when Eva got her Oyatsu Box. 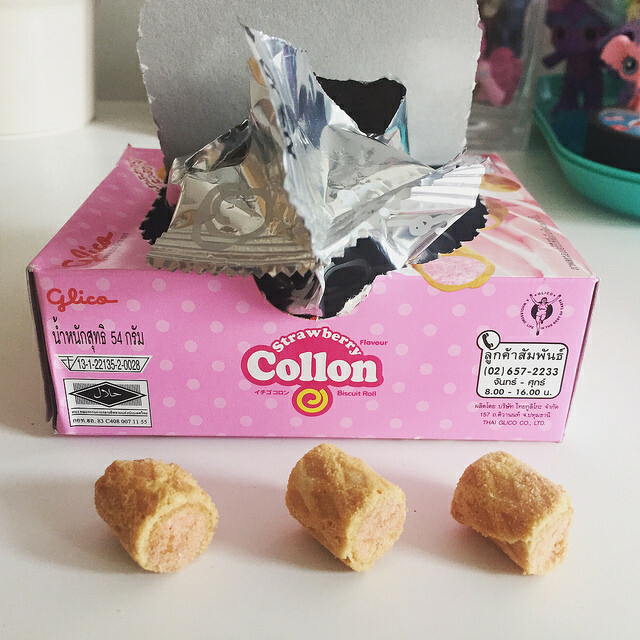 She got the Cream Collon and I fell in love immediately. They were so good. 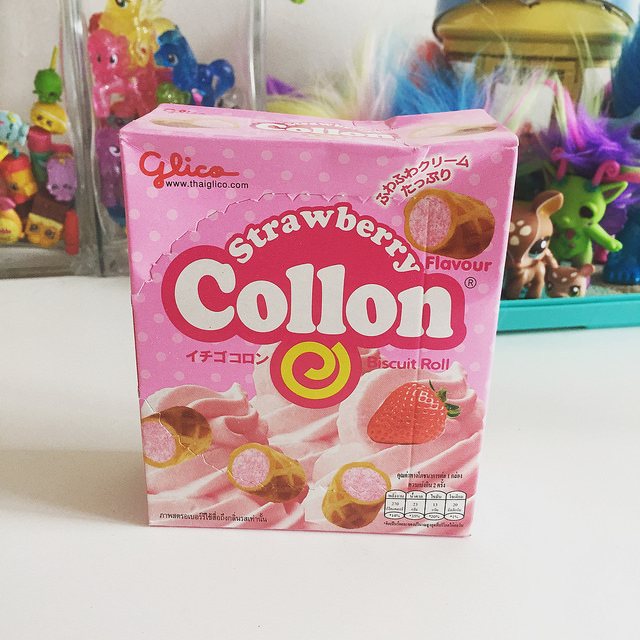 After loving the strawberry Pocky, she got from Tofu Cute, so much I decided to try the strawberry version of the Collons. I was not disappointed. The filling isn't as creamy as the Cream Collons or as moreish but in a way that's a good thing as eating too many can leave you feeling a little sickly. I really love the packaging too. I think it's super cute! It also stores well since there's a bag inside the box. 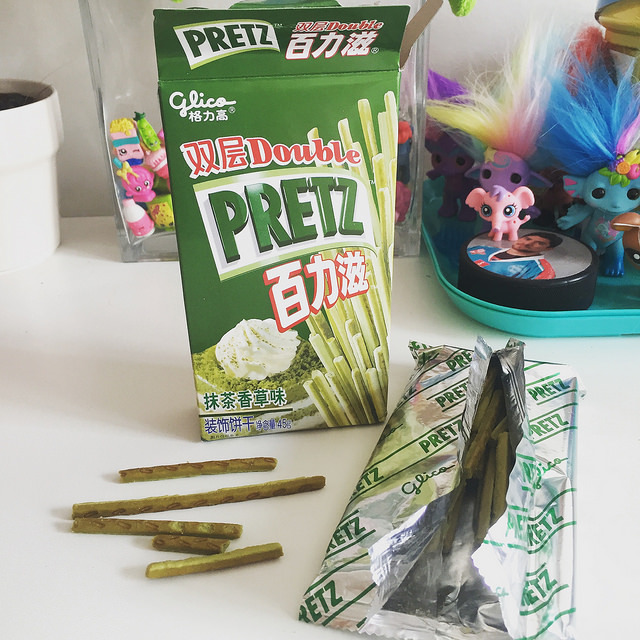 I picked these out of the Pocky selection they have on Tofu Cute. As I said, I loved the strawberry Pocky Eva had gotten and I wanted to branch out and try different types. This was a bit of a wild card as I wanted to taste something less generic. I ended up really liking these. These aren't dipped like the strawberry ones. They sort of reminds me of how shortbread tastes. I've never had green tea before so I can't tell you if they really taste like green tea but I was getting a lot of vanilla but with a little kick of something else. I did really liked these but they're probably not something I'd jump at the chance to get again. 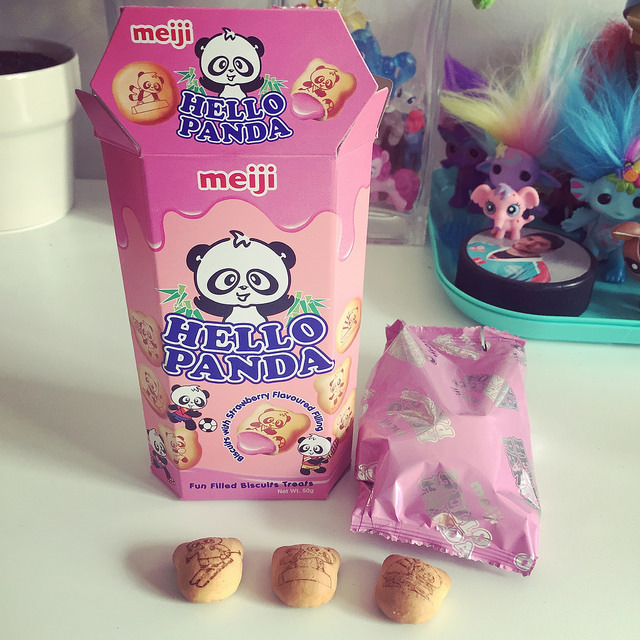 I love this super cute packaging! Another strawberry yummy! 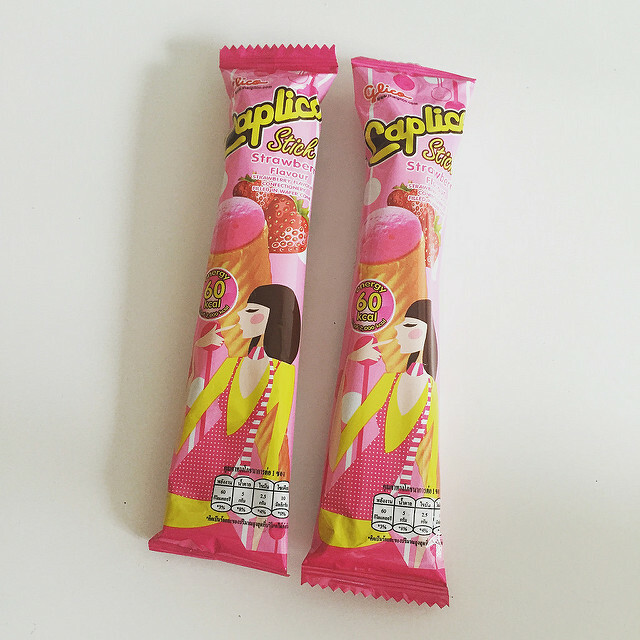 These were probably my favourite out of the sweets I bought. 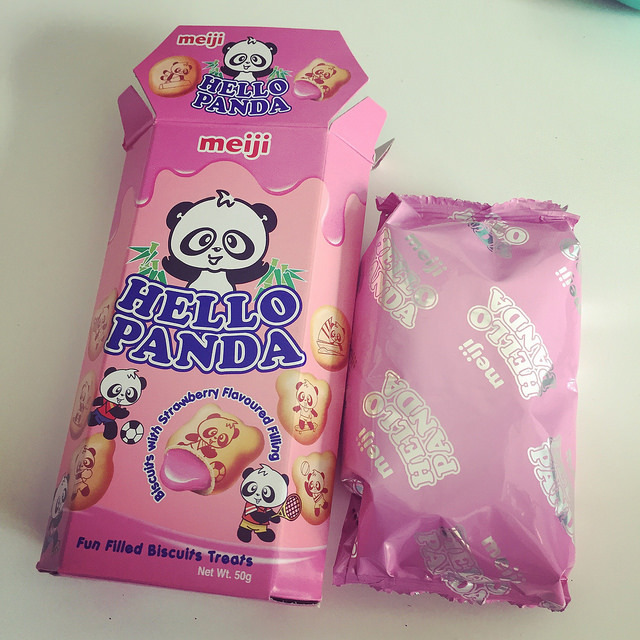 Our local Tesco have little Koala biscuits similar to these in their Asian section. I'm addicted to the cream filled variety. I figured these would be similar but filled with strawberry and I was right but there are some differences. These biscuits are bigger and the filling wasn't as creamy a consistency, nor was it as chock full. Though if they were I would imagine they'd have been a lot more sickening. The biscuit was also a little thicker, which I appreciated. I could literally eat my way through this box in one sitting and I had to really restrain myself so I could enjoy them longer! Will definitely purchase again in the future. 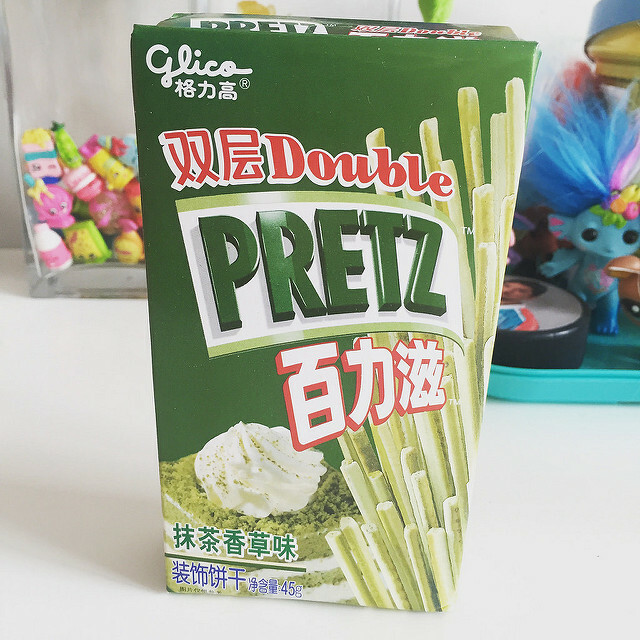 These are very similar to something my sister is obsessed with from the Asian isle of our local Tesco. I personally don't like the ones she buys for some reason but they're not peanut flavoured. Even so, I bought these ones as a bit of a wild card and I'm so glad I did. I love these! They really remind me of something that I can't quite put my finger on. 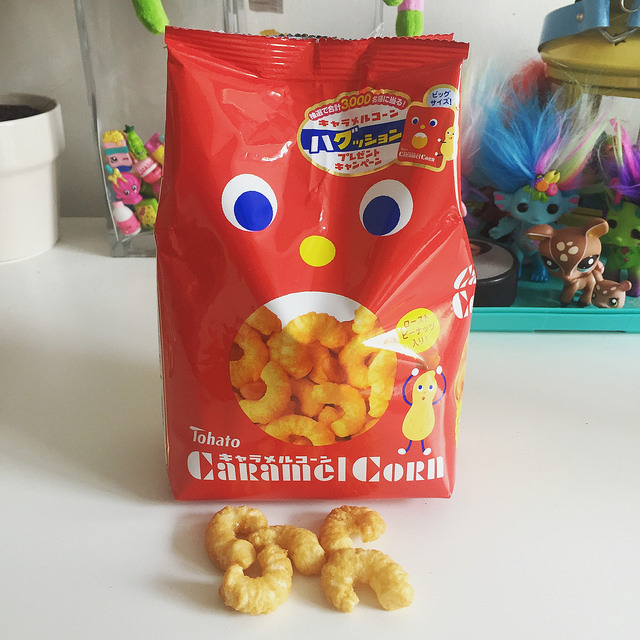 The peanut flavour isn't too strong but they're still very tasty. 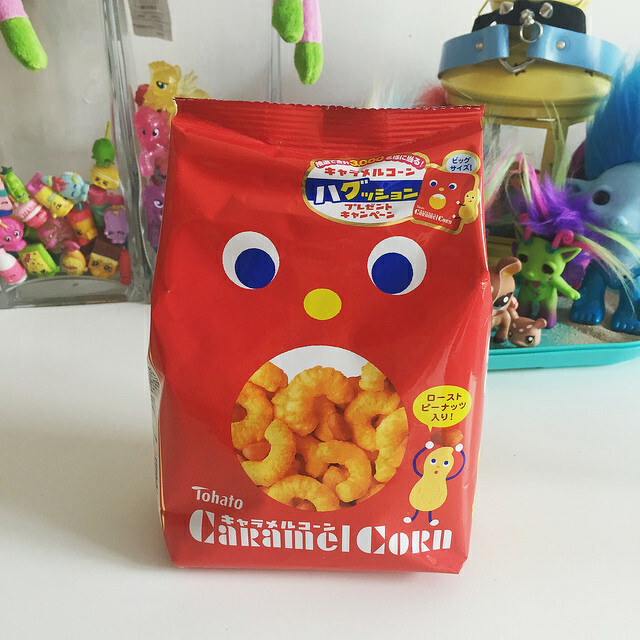 It would be very easy to munch your way through a bag of these. They were a little pricey at £2.70, so I'm trying to restrain myself so I can get my money's worth out of my enjoyment! 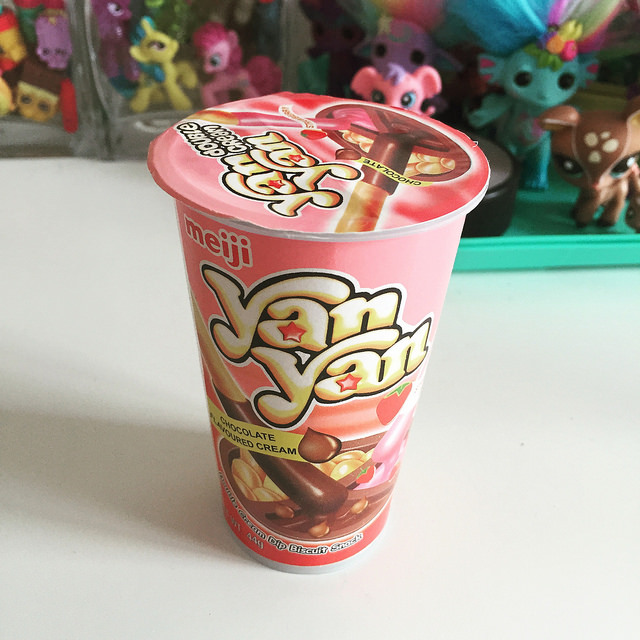 I love the Choc Dips you get here in the UK (I don't know where else has them) and while I was on this strawberry kick I thought I would try the Japanese equivalent since there's no strawberry Choc Dip. However, I figured to mix things up a little I would get the chocolate and strawberry double dip one. Just in case I sickened myself of the strawberry. I really liked this. There's more chocolate than strawberry and there's also a better stick to dip ratio than you get with Choc Dips. I also prefer these bread sticks as I felt they were sweeter and had more of a crunch to them. 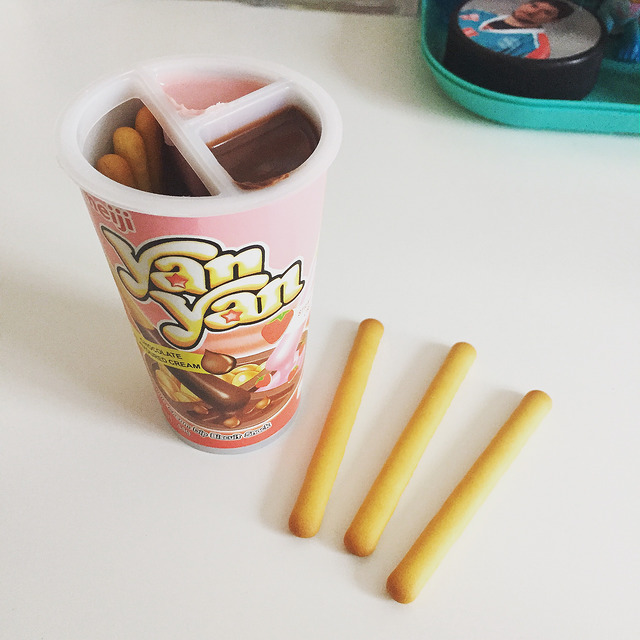 I would definitely buy these again and I look forward to trying the vanilla dip variety in the future. I am IN LOVE with these. 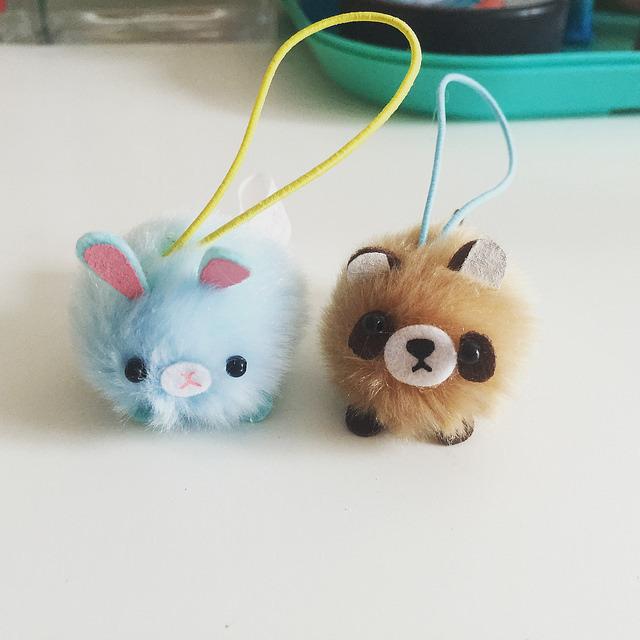 The little blue rabbit is mine and I bought the racoon for Eva. I didn't actually take notice of the sizing of these little cuties and so they were smaller than I thought they were going to be. However, I think that just means they're even cuter! I'm really looking forward to hopefully getting a couple more of these. Especially since they're so affordable at £1.50 each! I'd really love the pink loppy bunny next! I can't write a proper review of these as I haven't actually eaten my own one yet but I did taste a tiny bit of the one I got for Eva. I don't really know what texture I was imagining for the strawberry part but it wasn't what it ended up being. I'm not even sure how to describe it but the website describes it as a light and bubbly candy filling. I only had a tiny bit of Eva's, so I'm looking forward to eating mine in the future! 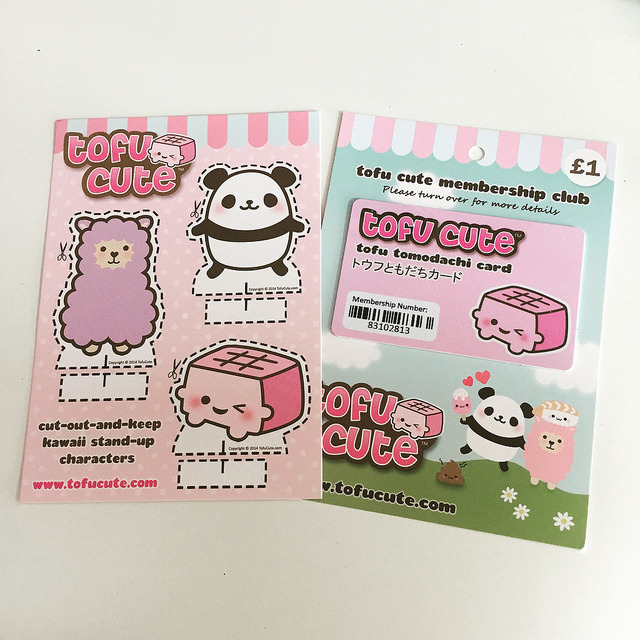 Lastly, I got this adorable Tofu Cute membership card. You get points for every purchase which you can then redeem as discounts off web orders at a rate of 1 point = £0.01, or trade them for special items worth more than the points. I have 27 points so far! The other little card is just something they send with orders. Sort of like a business card but with these cute little cut outs on the back! Pretty neat, huh? So there you have it. My Tofu Cute haul and what I can tell is going to be the first of many! I can't recommend this site enough!